The Kenimer Site is an archaeological site located on the southeast side of Brasstown Bald near Sautee Nacoochee, Georgia in White County. The site contains two earthwork mounds located on top of a natural hilltop. The Kenimer site is located on an erosional remnant hill just to the north of and overlooking the Nacoochee Valley. 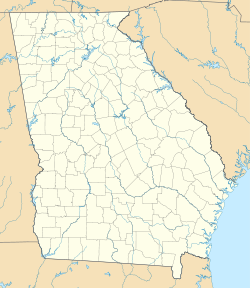 It overlooks the junction of the Chattahoochee River and the Sautee River, which is about 1.5 kilometres (0.93 mi) to the southeast. Mound A, the largest of the sites two mounds is 150 feet (46 m) above the level of the flood plain of the rivers and approximately 1,450 feet (440 m) above sea level. Georgia State Route 17 is positioned 300 metres (980 ft) to the north of Mound A. Because the mounds are located on an irregularly shaped natural hill their exact dimensions are hard to determine and vary from side to side. The summit of Mound A is approximately 46 metres (151 ft) square. On its high northeastern side it is over 10 metres (33 ft) in height and on its western side adjacent to Mound B it is 6 metres (20 ft) in height. Mound B is located to the west of Mound A and is oriented with both mounds northwestern edges in a straight line. The summit is approximately 12 metres (39 ft) square. The elevation varies on each side but is generally not much over 1 metre (3.3 ft) in height. The fact that the site is located on top of and utilizes an existing natural hill as part of its bulk is unusual. The only other known example in southeastern US archaeology is the Emerald Mound located near Natchez, Mississippi. The site was mapped and test excavations performed in the summer of 1997 under the direction of Mark Williams as part of the Archaeology Field School of the Department of Anthropology for the University of Georgia. Little human habitation debris was found on the mounds leading the archaeologists to conclude the site was used only for a short time and probably for ceremonial purposes as the surrounding topography would make it hard to have a village site adjacent to the mounds. Because of its unique features it is possible the site was constructed to resemble the platform mounds of the Macon Plateau area, such as Ocmulgee Site, located roughly 100 miles (160 km) to the south by peoples "that did not understand the construction history or social/religious context of such features". Some pottery and lithic debris was found at the site. All the ceramic pottery sherds found at the site dated to the Late Woodland period Napier Phase and dated to roughly 900 CE. The lithic debris found at the site was all locally available quartz and Ridge and Valley chert from the northwestern Georgia area. A small greenstone celt was found during a posthole test on the summit of Mound A. In December 2011, architect Richard Thornton writing for the content farm Examiner.com claimed that the mound was of Mayan origin. Mark Williams, an archaeologist at the University of Georgia who has spent three days surface collecting at the site, write, "The Maya connection to legitimate Georgia archaeology is a wild and unsubstantiated guess on the part of the Thornton fellow. No archaeologists will defend this flight of fancy" and via his Facebook page: "This is total and complete bunk," and "There is no evidence of Maya in Georgia." In 2010, archaeologist Johannes Loubser wrote in a peer-reviewed journal article that the excavations at the Track Rock Archaeological Site on the opposite side of the mountain from the Kenimer Site had been halted when graves had been discovered, and the site was probably precontact. Thornton used excavations performed by Loubser as "evidence" for his theory. Upon learning this, Loubser responded, "I think that [Thornton] selectively presents the evidence. ... But he's a better marketer than I and other archaeologists are. When you make a claim like that, you have to back it up with hard evidence. There's a lot of opinion out there." ^ a b c d e f Williams, Mark (1999). "Archaeological testing at the Kenimer Site, 9WH68" (PDF). University of Georgia. ^ Ferguson, David (22 Dec 2011). "1,100-year-old Mayan ruins found in North Georgia". The Raw Story. ^ Williams, Mark. "Archaeological Testing at the Kenimer Site" (PDF). Lamar Institute. Retrieved 24 March 2013. ^ a b Bill Torpy (2012-01-04). "Squabble over presence of ancient residents in Blairsville". The Atlanta Journal-Constitution. Archived from the original on 2014-07-26. ^ Loubser, Johannes. "An Archaeological and Ethnohistorical Appraisal of a Piled Stone Feature Complex in the Mountains of North Georgia" (PDF). Society for Georgia Archaeology. Retrieved 24 March 2013.